In the past, our services were centered around weekly group meetings, in which students shared their experiences, received support from one another, discussed topics of interest, and built a community on campus that supported and affirmed LGBTQIA individuals. This year we will be adding a 24/7 “warm line”, which students can use to reach someone to talk one-on-one, anonymously and confidentially. If a student prefers talking to someone face-to-face, arrangements can be made to meet the student in a public environment on or off campus. The warm line can be accessed by calling 865-724-7544. We are adding the warm line so that students who are struggling with orientation/gender identity issues can begin to process their feelings and ask questions. The goal is to reduce students’ anxiety, fear, depression, and any other problems that students might experience as they address orientation/gender identity issues. There are so many questions that people have as they address their orientation. Our warmline is available to you 24/7. All you have to do is call 865-724-7544. We’ll go from there and work with you at your pace. If you are already “out” as a member of the LGBTQIA community, you can find support and make friends at our “LGBT Alumni of Carson-Newman” Facebook page. Just look us up on Facebook. The Facebook page is a closed group so that member’s identities and comments are kept within the group. You can ask to become a member by answering a couple of questions. We also have an online Facebook page for students. If you would like to join our online Facebook page for CNU students, shoot me an email (tomcogburn@earthlink.net) and I’ll make arrangements for you to be added. You can also send a message to me (Tom Cogburn) on Facebook asking to join the student group. In addition to the warm line, we hope to be able to re-establish our weekly group meetings. As soon as we are able to find a meeting space that it close to campus, I’ll post the day and time on which the meetings will take place. I know what it’s like to be a closeted gay man on Carson-Newman’s campus. The pressure to fit in–to be like everybody else can be staggering. The fear of being found out is ever present. These feelings can eat away at you. The energy it takes to remain in the closet can impact your ability to study and participate in school activities. Much of the time you feel alone and confused. Reach out to us by calling 865-724-7544. I might not have all of the answers that you’re looking for. But sometimes just talking about your fears and concerns–getting them off your chest and out in the open with one other person can really help to take the load off. You might not be ready to kick down the closet door. And that’s fine. We work with you at your pace. Know that you are important. Know that you are loved. Know that you matter. Know that you are appreciated. Know that you are strong, even when you might not feel very strong. With God’s help, we can get through anything. You’re Invited to the 2018 LGBT Campus Support Services Meet & Greet!! I have not informed you of the many achievements of the LGBT Alumni of Carson-Newman of our organization so far this year. We continue to reach out to the CNU LGBT community in an effort to provide alumni, current students and staff with a venue for dispersing information, support, and general discussions. “Meet, Greet, and Eat” event at the Highlander Center in New Market, TN. Our group discussed plans for this year; including participation in the Knoxville PrideFest Celebration, the 2015 Scholarship, the creation of t-shirts to be sold in order to raise money for the scholarship fund, updates on the weekly LGBT Student Social-Support Group, and ongoing efforts to build bridges with CNU so that current LGBTQPA students will have a safe, supportive, and affirming experience at Carson-Newman. T-shirts for sale!! A member of our LGBT Student Social-Support Group created an amazing design that we used on t-shirts, which we sold to members in an effort to raise money for our scholarship fund. There was a great deal of interest in the t-shirts. Though I cannot recall the exact figure of how many t-shirts were sold, I can say that I believe this is a excellent way to raise money for the scholarship and plan to use it in the future. 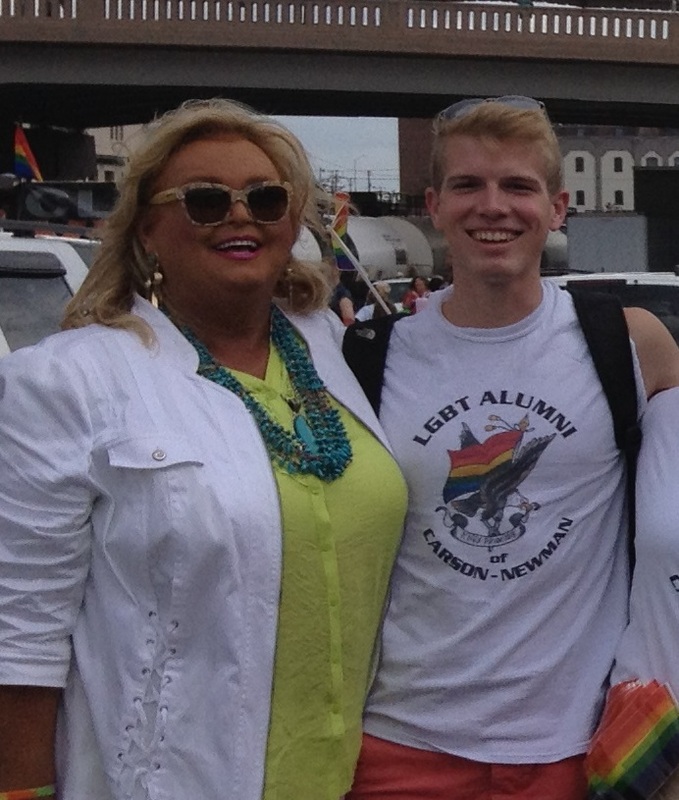 We greatly increased our presence and participation in the Knoxville PrideFest celebration this year. Not only did we have a booth, where we distributed literature concerning the LGBT Alumni of Carson-Newman, but we also raised quite a bit of money for our scholarship fund. This year we created a package that booth visitors could enter to win. The package included 2 Dollywood passes; a a lovely, handmade dichroic-glass necklace (provided by artist John Mayfield-Stewart and his husband Joie Mayfield-Stewart; and two rainbow flags that can be attached to a car’s rear windows to support the LGBT community. A donation was requested, but not mandatory to enter the drawing for the package. Another favorite (and profitable) booth fundraiser was face-painting. 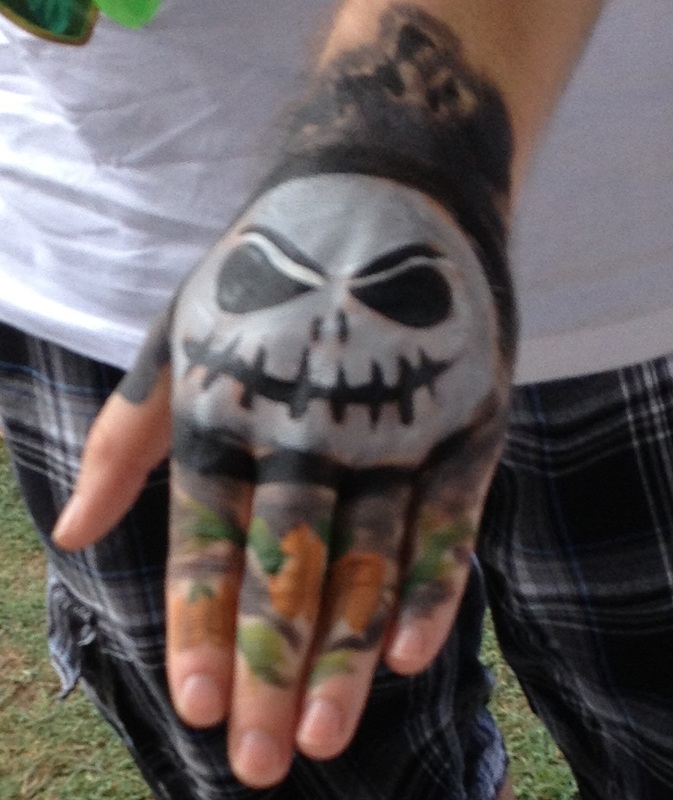 Several of our art students painted dozens of flowers, rainbows, and other designs on faces, chests, wrists, etc. All-told, we raised well over $400 at the booth this year. 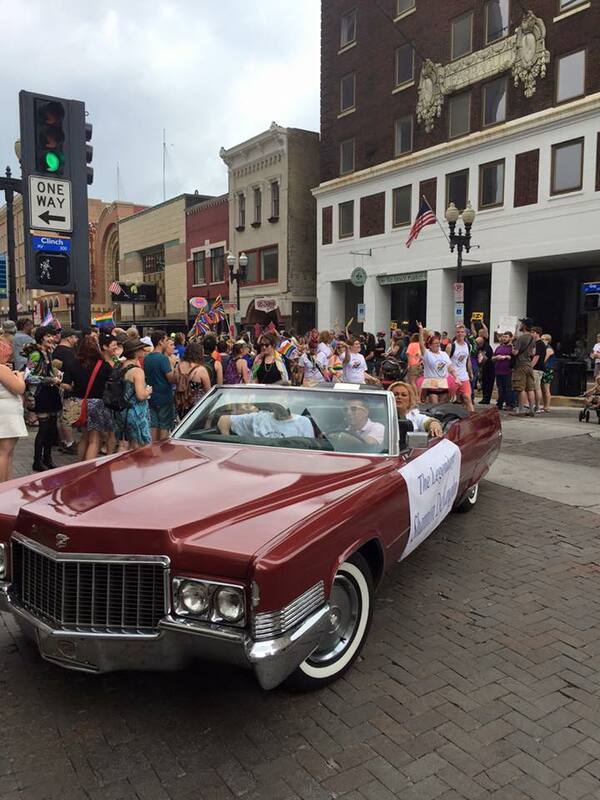 This year we participated in the Knoxville PrideFest Parade. 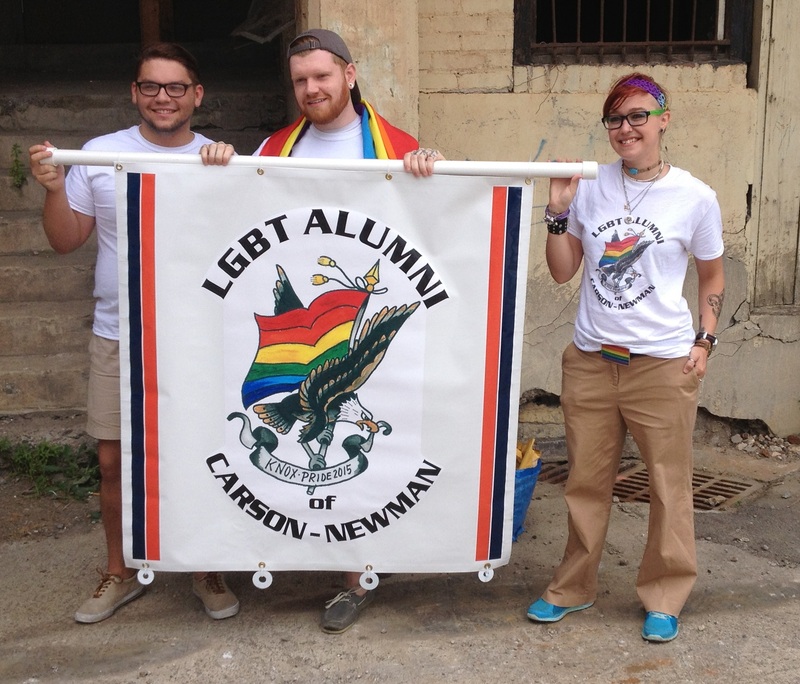 We had about 20 marchers; all wearing the 2015 LGBT Alumni of Carson-Newman T-shirts. A large banner was carried in front of the group (see image above). In addition to the marchers our group was very lucky to have one of Knoxville’s legendary female illusionists, Shannon DeVaughn. Shannon rode in the backseat of a 1970 Cadillac convertible–looking radiant and regal. Many people literally ran out into the street to hug and have their pictures taken with Shannon as she passed through the throngs lining each side of Gay Street. To top off our participation in the parade, our marchers threw rainbow bracelets and flags to parade attendees. Next year we’ll have to think very hard to come up with a way to top this year’s PrideFest. The LGBT Student Social-Support Group has been a great success. We routinely have between 8 and 20 students who attend each week. The group has been so popular that beginning Aug. 2015, we decided to hold the group twice a week (Tues and Thurs) so that more students could attend. Because of the hard work and dedication of the LGBT Alumni of CN members we were able to award two, $1,000 scholarships this Fall semester. Applicants had to fill out an application explaining their financial need, participation in the LGBT community, and other factors that would make them worthy recipients. Richard Allen, who was completely rejected by his family after he came out, was one of the winners. Another very deserving recipient, who is not out to his family, also impressed the scholarship committee with his scholastic achievements and community work. One area of concern that a couple of our students are facing is marriage. These two students plan to be married to their partners in 2016. CNU and the Tennessee Baptist Convention may not recognize their marriage. As I understand it, it is within their First Amendment Rights to not recognize any marriage between two people of the same gender. And since the Code of Conduct at CNU forbids sexual relationships outside of marriage, there could be problems for these students. I have reached out to administration to see how this issue will play out at CNU. There are no clear answers at this point. –In March; we had our first group meeting at the Highlander Center in New Market TN. It was there that we set the agenda for 2014. –In May, due to generous donations, we were able to sponsor LGBT sensitivity training through the University of Tennessee’s “Safe Zone Program” for several CNU professors and other staff. This training will be used to train other CNU professors and staff in the future so that students have informed and accepting individuals to turn to in times of need. –Also in May, we became an official Tennessee Charitable Organization so that our organization can continue to meet the needs of larger CN LGBT community. 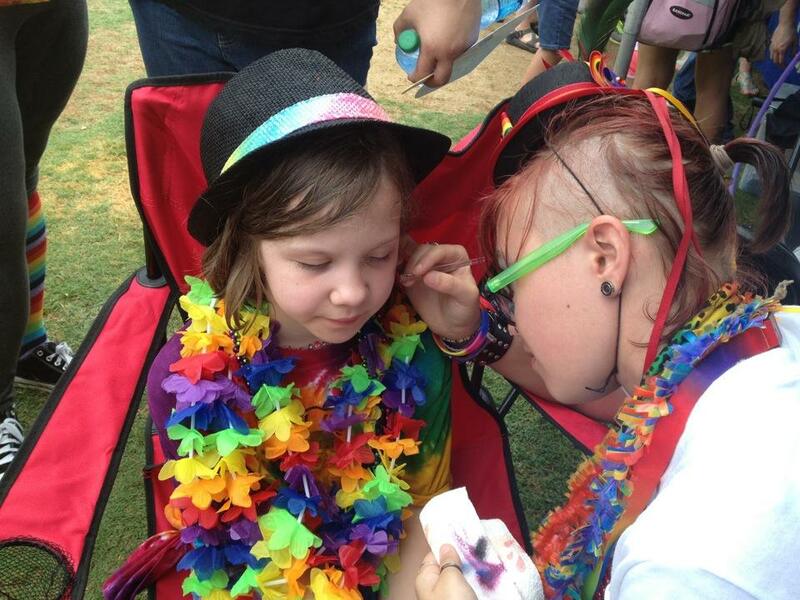 –In June we participated in our first Knoxville PrideFest event. It was made successful by hundreds of visits to our booth, where volunteer students talked to alumni and potential CNU students. We raised money for our 2014 LGBT Alumni of CN Scholarship Fund. We also gave away two tickets to Dollywood, which had been generously donated to our little organization. Many of you participated by donating money, muscle, and water so that our booth was a great hit with those attending the festivities. –In September we started the CN LGBT Student Social Support Group, which is held, weekly, at St. Barnabas Episcopal-Lutheran Church in Jefferson City. So far, the group has been successful. We have several regular attendees and are blessed with loving (and nutritional) support from the church’s members. –In November we were informed of a student who was in need of assistance so that he could remain in school next semester. He had shared his orientation with his family, hoping that it would bring them closer. But as you know, this was not the case. Upon hearing about this young man’s situation, many of you dug deep and quickly raised $2600 to make sure that he would have what he needs to continue to attend CNU. Also, many of you sent messages, offering to house him, offering to help him navigate the financial aid process to get as much assistance as possible, offering him holiday gifts, etc. Throughout this entire year, you have gone above and beyond in showing love and support to the CNU LGBT community. I am SO PROUD to be a part of such an amazing group! Here’s hoping that 2015 is as successful as 2014! In 1989 I was finally able to destroy the closet where I’d hid most of my life. Most LGBT people know this closet very well. I was 23 at the time. For years I’d been begging and pleading with God to “change me”. I didn’t want to be attracted to men. I wanted to be “normal”. I wanted to escape the certain “path to hell” that I’d heard about most of my life. I wanted to experience a relationship that I did not have to keep secret. There were so many things that “I” wanted back then. One fall afternoon I was at my parent’s home in rural East Tennessee, helping my dad burn off the dead vines and stalks that covered our once thriving garden. Back in those days, I seemed to be in a constant state of prayer, anxiety, and deep depression. But standing out in our garden in the cool, crisp air; smoke rising from the small mounds of debris; I was struck by the fact that I’d always been praying for what “I” wanted. I’d never prayed and asked what God wanted for me. This was truly a watershed moment in my life. I spent the next few years gaining my strength; getting to know who I really was (I’d hidden so much of myself for so long). I started going to a LGBT support group at the University of Tennessee in Knoxville. I went to a couple of bars. I started dating guys. I came out to friends, family, and co-workers. And while it wasn’t always a smooth, enjoyable path; it was certainly preferable to the path I’d been on for the vast majority of my life. During that time period I made two trips to San Francisco. I’d always heard that there were a lot of gays and lesbians in San Francisco, but nothing could have prepared me for what I experienced. First off, San Francisco is an amazingly beautiful city. The cool and moderate climate means that plants don’t die during the winter. I saw entire hillsides of geraniums—plants that we normally only saw during the summer months back home. Row houses were covered in bougainvillea. Some of the old Victorians had 8 to 12 colors of paint and gold-leaf detail on them. And the people seemed so laid back. Visiting The Castro District was my favorite… Men and women held hands with their partners. Restaurants were filled with LGBT people who looked and acted so normal; so happy in their day-to-day lives. There was even a “gay hardware store”—Cliff’s Variety—where you could find anything from nails, to shower curtains, to over-the-top wigs on sale. The energy I experienced there told me that one day I would live there. In 1994 I made the big move out to San Francisco. I moved there with a college friend. Neither of us had jobs lined up. Each of us had a little bit of savings. We were totally blindsided by the high cost of living. It took us weeks to find a place we could afford. We were also completely unprepared for living in a large city. Nobody tells you about the parking and traffic nightmares. They don’t tell you that insuring and registering your car can cost a small fortune. In both of our previous cities, coming out was such a momentous event. People either accepted your news or they didn’t. Each positive coming out event was so exquisite and affirming that you couldn’t wait to do it again and again. But in a city where there were so many openly gay people and in such an affirming community, being gay was literally no big deal. You were just another gay man among the tens of thousands of other gay men walking the streets, going to work, recreating, worshipping, etc. It took me a good year to realize how amazing it felt to be able to be “average”. I forever lost that feeling of dread that someone might react negatively because they discovered I am gay. I didn’t worry about co-workers or bosses knowing about my orientation. I was at peace. I was comfortable. I was normal. I don’t think LGBT individuals who have never experienced such freedom can fully understand what “normalcy” feels like. You spend years—sometimes decades—feeling like a freak; some broken, sinful, soul. You carry around shame. You are fearful of your surroundings. To be relieved of these overwhelming feelings is unlike anything most can imagine. I was lucky to have been able to live in the San Francisco Bay Area for the better part of 15 years. The shame, the guilt, the self-hatred; all of that is gone. Even though circumstances led me to move back to Upper-East Tennessee (one of the many buckles of the Bible Belt) I will forever be transformed by my years of living in San Francisco. I no longer accept other’s attempts to make me feel “broken” or “disordered”. I no longer hate myself. And I know—have known for 25 years—that it was God’s will for me to be gay. I don’t know why. I don’t need to know why. I just accept it and go on with my life. If I could have one wish granted it would be that every LGBT individual on the planet could experience what I’ve experienced. I still see young LGBT people, who hate themselves; who are fearful of friends/family/co-workers; who are struggling with their orientation in a world that largely still misunderstands us. I don’t want them to struggle with these issues for years—even the rest of their lives. I have seen the other side of the fence… The grass really is much greener. Pastoring… Shouldn’t It Be A Two-Way Street? When we get sick, we go to a doctor. When our cars break down, we go to a mechanic. When we have spiritual questions, we go to a pastor. After all, each one of these professionals has specialized training and education in their areas of expertise to help us with our specific needs; right? But what if that’s not always the case? Pastors might not have better insight to issues of the spirit than anyone else. I say this from a place of love and respect for many great pastors who I have known. The best pastors are always questioning and seeking God’s will for mankind. But like any other human being, pastors are fallible. 18 Servants, be submissive to your masters with all respect, not only to those who are good and gentle, but also to those who are unreasonable. 19 For this finds favor, if for the sake of conscience toward God a man bears up under sorrows when suffering unjustly. 20 For what credit is there if, when you sin and are harshly treated, you endure it with patience? But if when you do what is right and suffer for it you patiently endure it, this finds favor with God. 21 For you have been called for this purpose, since Christ also suffered for you, leaving you an example for you to follow in His steps (1 Peter 2:18-21). As slaves began to adopt Christianity and read about Christ’s commandment to us all to love our neighbors as we love ourselves, they began to realize the hypocrisy of the “traditional Christian values” of their day. They began to question their fate. They began to seek justice and pray and fight for their freedom. I’m sure there were deeply devout pastors who saw the groundswell of support to end slavery as an assault on their beliefs; just as there were pastors who viewed the concept of racial equality as unacceptable. It’s easy for us in hindsight to believe that these pastors were totally misguided. “If only they had understood scripture more thoroughly.”, we argue. “How on earth could they have supported the buying and selling of human beings and then forcing them to endure excessive labor and inhumane living conditions?”, we ask ourselves. Pastors and other religious leaders seem to utilize scripture as their primary source of guidance when they are faced with a variety of issues. This is particularly the case when it comes to issues concerning the LGBT community. They do not understand that to gay and lesbian Christians, the issue of God’s love; His purpose in creating us; and His desire for us to live a happy and fulfilling life has been answered. They do not understand that gay Christians have had to struggle with these issues and have gone directly to God; just as slaves, women, various races, and other minorities have done in the past. I’ve often said, “If you want to know about homosexuality as it relates to Christianity, ask a gay Christian.” We’ve lived through the struggle. We’ve gone to God for answers. And we are adamant that He created us, loves us, has purpose for us, and wants us to be happy. I was a social worker for 25 years before starting the LGBTQ&A Alumni of Carson-Newman; a small, non-profit organization to help LGBT students who attend a Carson-Newman University; a faith-based college in rural East Tennessee. Our group has so many ideas about how to not only help these students, but also how to work with the school’s administration to ultimately change the environment to one that is affirming and supportive of LGBT students. Many people are just now beginning to realize the needs of these students. Study after study shows that young LGBT individuals are at a higher risk of brutal pitfalls; especially those who find themselves living within the type of community one might find on a conservative, Christian, college campus. These pitfalls include self-harm, depression, anxiety, isolation, family alienation, substance abuse, poor school performance, bullying, and higher rates of STDS including HIV/AIDS. Coming up with ideas that will make a difference to LGBT students is fairly easy. We have 150 brilliant members in our group; all of whom contribute their knowledge, experience, and skills to the organization. We have been able to fund all of the projects for this year except one: our scholarship fund. We have set a goal of raising $1,000 for a scholarship. We’re only about half way there and the deadline is quickly approaching. I will be so disappointed if we’re not able to reach our goal. The student who requested financial assistance is an openly gay young man who has amazingly become a student leader at Carson-Newman. That’s pretty incredible considering that he goes to a Tennessee Baptist affiliated university in rural East Tennessee. The odds are stacked against him. Yet he has found the strength and courage to get himself elected to the Student Government Association with a stated platform of LGBT equality and he has become an ambassador of sorts to other LGBT students at CNU—working with them to create a supportive network of friends and professors. 1.) Fundraising events, such as dinners, silent auctions, online auctions, etc. It’s been my own lack of business experience that has left us in the predicament we’re currently facing. This is my learning curve; painful as it may be. In the past 24 hours donations to the scholarship fund poured in from around the country. We have added an additional $600 to our fund!! We have surpassed our goal of $1,000! Just when I thought I’d seen everything… Thank you God and thanks to all of those who helped out! !